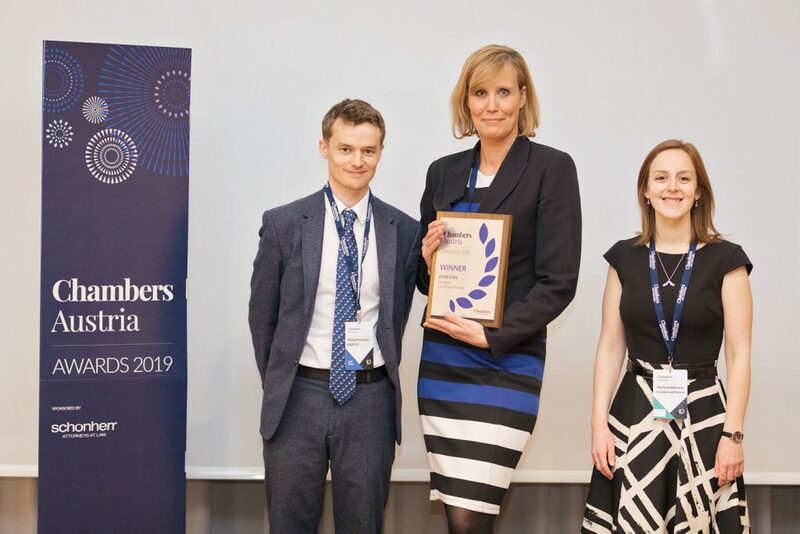 On Thursday, March 21, Chambers and Partners hosted the 2019 Chambers Austria Awards for law firm excellence. The achievements of the leading law firms and lawyers practicing in the market were recognized by this estimable London-based publisher and observer of law firms and lawyers across the globe. As the event organizer, Chambers presented five prestigious law firm awards and one Outstanding Achievement award to an individual. The shortlisted firms were selected after considering the results of extensive research and analysis. “Having conducted thousands of interviews and carefully analysed the most impressive legal work carried out by firms in the Austrian market, the nominated law firms have been selected for their outstanding legal work, strategic growth and excellence in client service. All nominated firms have demonstrated an exceptional calibre of work and service and should be congratulated for their achievements“ (Chambers Austria Awards 2019). We would like to take this opportunity to thank each member of our hard working KNOETZL family for their continued, diligent efforts to elevate our clients’ advantage, and for their outstanding, thoughtful and cutting-edge work product. It takes the time and resources we ask them to commit, to continue leading the law firm market in our focused area of practice. Huge thanks also to our clients and references who have kindly spoken with the Chambers research team and with whom they have so generously shared their insights. This feedback played a vital role in the research process. Our heartiest congratulations also go out to Dr. Astrid Ablasser-Neuhuber, winner of the “Outstanding Achievement” award and also to our colleague firms of Schoenherr, Dorda, Freshfields and Eisenberger, with whom KNOETZL proudly shared the stage as top award recipients in their respective categories.